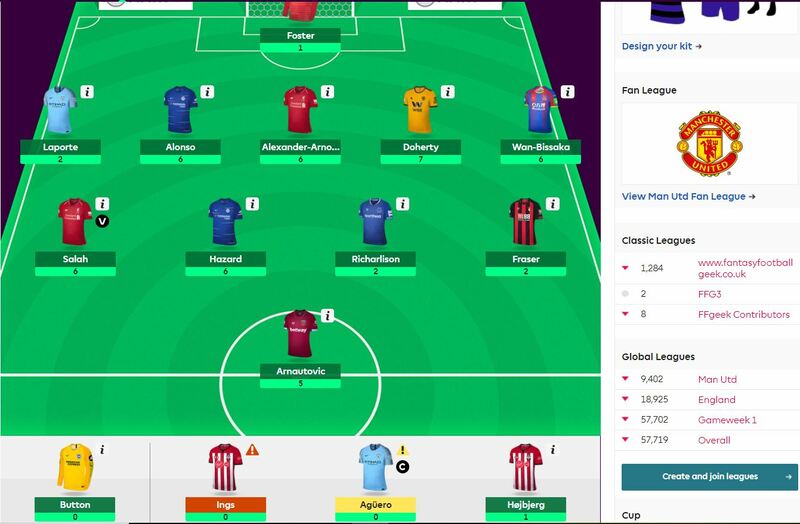 I went into GW14 in detail in my early thoughts article on the FFGeek team article so I won’t go into it too much here. So using my metrics to evaluate a gameweek this would be counted as a failure. A red arrow of 14k to 57k OR, a gameweek rank of 2.9 million vs a target of under 1 million. However the difficult part was that I had 6 returning players vs a target of 4 which you would hope would lead to a solid green arrow. However none got more than 7 points and my captain failure with no return was behind that. 1 transfer and £0.5m in the bank. 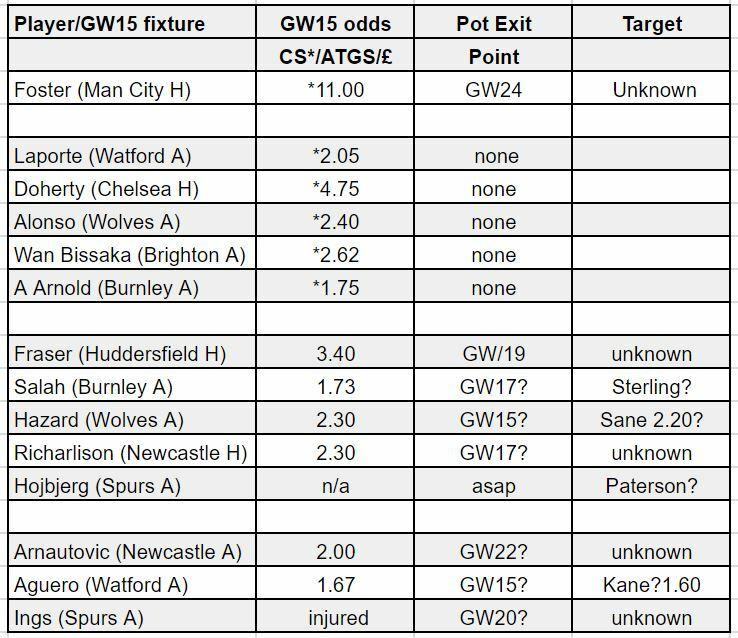 So you may have seen this captain planning schedule in my imaginary wildcard article which shows that unless you want to play FPL chicken with your captain choices that an Arsenal and Spurs captain option will be handy. Generally their fixtures are strong as well. Chelsea and Liverpool are less necessary. 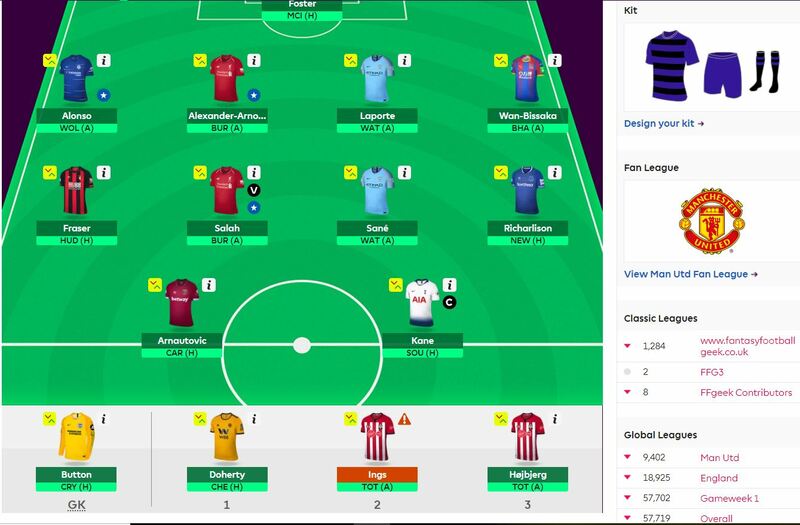 So I’ve spent sometime working out how I can get Kane and Aubameyang/Lacazette plus Sterling and Sane in the team over the next 2 gameweeks. That means 2 -4’s over the next 2 weeks. One thing is certain though is that it’s not realistic to get the 4 of Sterling, Sane, Aubameyang and Kane into my team. I will either have to sacrifice Aubameyang or Sterling effectively and both if I want to keep Arnautovic. Aguero out for Kane and Sane in for Hazard. The only issue was whether to go Wolves at home to Chelsea or Palace at Brighton. I’ve gone for Palace at Brighton. I feel like it’s going to be a tough week again. My captain analysis article as usual provides alot of information but it is another 50/50 call. Alot of me wanted to go Salah but I stuck with the supposedly safer pick of Kane due to the polls. I have also done the exact same transfers as you Geek, only I carried over my FT from last week so no -4 for me. I am however taking a hit next week to do Mitro to Auba and Salah to Martial. Going to take a chance on Martial for the home game against Fulham before changing to perhaps Silva the following week. Happy not to get another City asset this weekend as they are away to Chelsea.